Every so often we dip our toes into a series called Danny Recommends:, posts that tip you off to the stuff that I…you know. The recommendations might be products for use in your ministry, resources that will help you develop leaders around you, or just fun stuff that you need. Want. Whatever. Check books and such over at the Reading List, but these posts will go into further detail. For other posts in the series, check out the link at the bottom. In a recent post I talked about six reasons you need a First Time Guest Tent. But how do you get started? What resources and vendors are out there? First, a word on your two variables: cost and permanence. Your budget may not allow you to start with all of the items below. That’s okay. Start somewhere. As you create a guest-friendly experience, you might be surprised to find that the budget will follow. If you are a mobile church, the resources below will be especially helpful for you (and therefore, probably the least expensive options). If your budget and location allows it, I would consider subbing in some cabinetry on wheels for your supply table. This is our typical setup for a tent. Your needs may vary. Supply table. I recommend a four foot adjustable-height table from Lifetime. Adjust to full height (36″) and top it with a spandex cover from Premier Table Linens (get the “open back” option). Supply drawers. We use a very simple set of plastic drawers on wheels, slid under the table, out of the way. Pub tables (for guests to use while filling out information). We’re huge fans of MityLite‘s products, and use their 30″ round, 42″ tall scissor-leg model. (Don’t forget to drape them with spandex from Premier.) We use three per tent…contact the folks at MityLite for a quote. Additional signage. Because the tent is emblazoned on all four sides with “FIRST TIME GUEST? STOP HERE.”, the tent is our sign. However, if we end up moving inside because of severe weather, we typically have to ditch the tent (depending on lobby space) and we’ll use this model from Signicade. First Time Guest bags. What good is a FTG tent without something to give away? See our full list here. Miscellaneous. Run through the rest of your needs: clipboards, ink pens, extension cords, etc., and launch well! Do you have guests fill information out on the same connection card that you use during the service or is a different first time guest card? If it’s different, could you provide a sample of what information the first time guest card asks for. We are thinking of implementing a first time guest tent. We already have all attenders fill out a connection card during the service, so I’m wonder if we should have the first time guests fill out this same connection card at the tent or something different? Brian, great question! Currently we don’t ask guests to fill out any connection card in the service itself. We simply invite guests to drop by the tent afterwards for a gift. However, in the past when we did have those cards in service, the info we asked for was very similar, though the format was different. I think the only new or different info we had on there was a spot for a prayer request or a box to inform us of an address change. I hope that helps! Let me know if you need anything else! Would you keep your tent up and staffed after a single-service church? Michelle, I absolutely would! 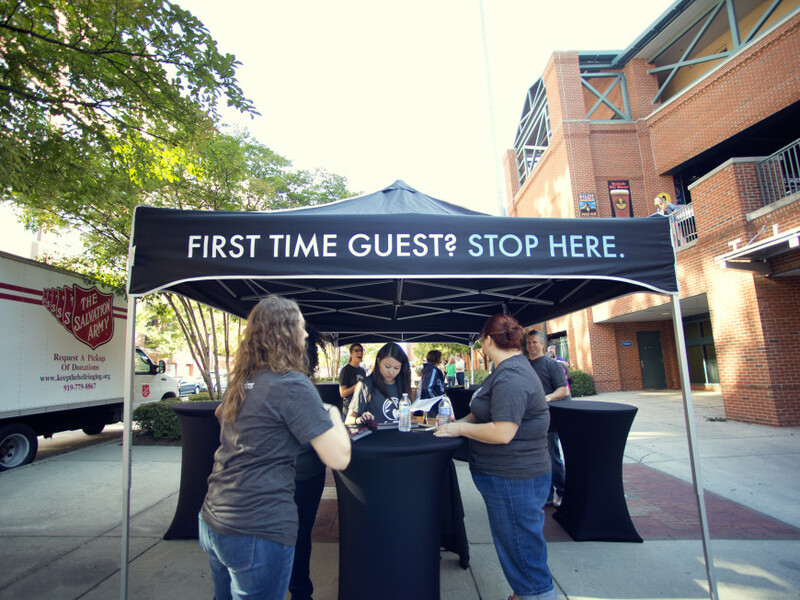 We’ve found that with the right end-of-service promo, you can actually see a high number of first time guests who will stop by afterward! I recommend that you leave the tent up for at least fifteen minutes following the service so that guests feel the freedom to engage with you.